Released in 2007, Knocked Up was a more than worthy follow-up to director Judd Apatow’s surprise success with “The 40-Year Old Virgin”. It was an uneven-if-funny flick with a whole lot of talent assembled and a decent amount of laughs. 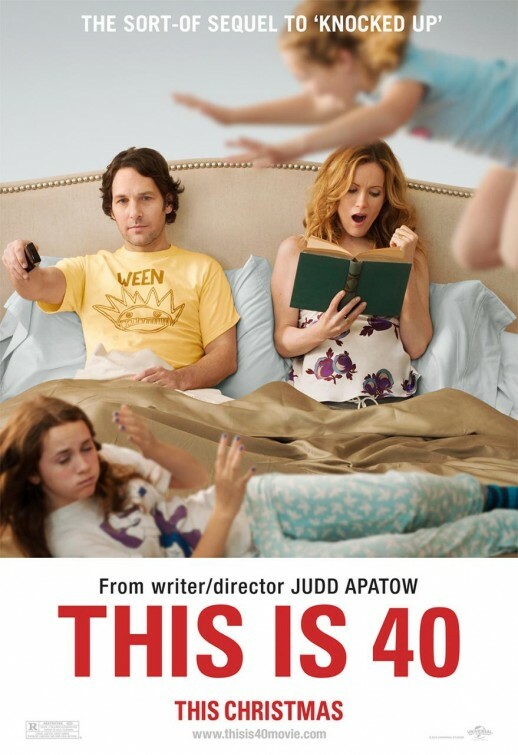 Apatow takes a few key characters from ‘Knocked’ and hits us with a quasi-sequel, 2012’s “This is 40”. Married for 16 years, Pete (Paul Rudd) and Debbie (Leslie Mann) are about to hit a big milestone….they’re both turning 40. Well, Pete’s turning 40, but Debbie refuses to admit she could possibly be 40 years old. Their marriage and home life have hit a bit of a rough patch as Pete’s record label is struggling to find a niche while Debbie’s boutique losing money by the barrel. Back at home, teenager Sadie (Maude Apatow) is mad at everything while younger daughter Charlotte (Iris Apatow) is just trying to grow up and not get killed by her sister. Both Pete and Debbie are struggling to find any sort of norm and with a whole bunch of problems from marriage to family to finances to work, nothing comes easy, and their marriage is paying the price. Do you notice anything about the plot description? Well, my first thought upon finishing the movie and then starting the review that nothing about it screams funny. I get it. Life’s inherent goofiness, craziness and uniqueness can produce some laughs from a natural place. “40” does have its moments. The cast is far too talented not to get some laughs, even if it was by accident. Those laughs come mostly in the meandering first half of the movie that introduces a whole lot of characters and a whole lot of subplots. It is funny. Apatow does know how to write characters and a solid script, but it also goes down a very dark route in the second half. The laughs are left by the wayside, and “40” turns into one depressing, not so enjoyable movie in the second half. Key supporting players in “Knocked Up”, Rudd’s Pete and Mann’s Debbie, get their shots at the lead roles here. While it isn’t always funny (far from it), the comedic duo does have a very believable chemistry together. That’s not always a good thing though for this longtime married couple who has seen their marriage lose some of its luster. Both are talented actors/comedians, whatever you want to call it, but at a certain point this movie becomes Pete and Debbie screaming at each other over and over again. Oh, and again. I haven’t been married for 16 years — I’m 27 as I write this — so I don’t know about all the good and bad of a 16-year marriage. It feels authentic because obviously marriage isn’t a walk in the park. As this marriage hits a rough patch though, it ceases to be an enjoyable film. “40” is too downbeat for its own good, and even talents like Rudd and Mann can’t save it from its own darkness. As a director, writer, producer, Apatow is a very talented guy, and people clearly want to work with him. The supporting cast in basically all his movies illustrate that point. Jason Segel returns as Jason, Deb’s trainer who’s got a way with the ladies. 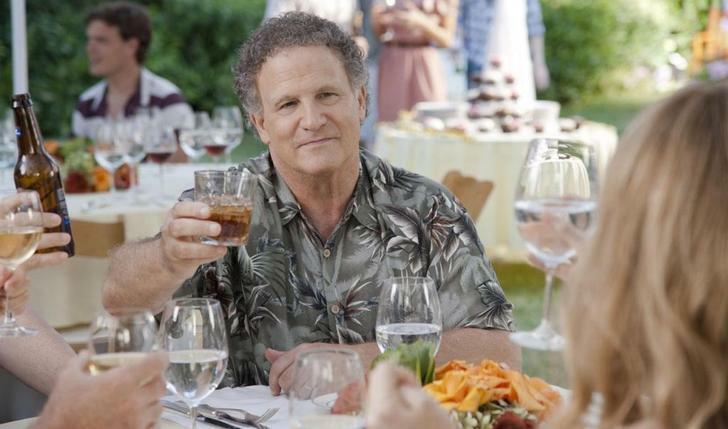 Albert Brooks is a welcome addition to the cast as Larry, Pete’s father who keeps borrowing money, while John Lithgow plays Deb’s estranged father. Megan Fox shows she’s got some comedic chops as Desi, one of Deb’s employees while Chris O’Dowd and Lena Dunham (of HBO’s “Girls”) play two of Pete’s record label employees. Robert Smigel is memorable as Barry, Pete’s friend. So obviously a lot of talent is on hand here. At a certain point I got the feeling Apatow just ran with the premise that “Hey, I’m working with (Insert Star’s Name here)!” and didn’t know what to do with himself. Oh, and there’s more names so keep on reading. It’s almost schizophrenic in its entirety. Brooks and Lithgow are somewhat necessary to the story. Other than that? Not so much. Segel is a trainer who wants to hook up with Fox who may or may not be stealing from Deb’s store. O’Dowd is a goofy quasi-stoner who wants to hook up with Fox. Dunham makes a couple snarky comments. Smigel is perfect in deadpan fashion. There are too many storylines going on here from Deb and Pete’s financial troubles, from a subplot with British rocker Graham Parker, to a drug-laced weekend getaway, and on to problems with the kids at school. Is this life? Yeah, in some fashion, but that doesn’t make it a good movie. The word that often came to mind as this movie wore on was ‘self-indulgent’. “40” clocks in at a robust, far too long 134 minutes. With an episodic, drifting story, it goes on endlessly and could have been cut by about 40 minutes. The very funny Melissa McCarthy makes an appearance as a foul-mouthed mother, her improvised scene never ending (and uncomfortable to boot). Returning from “Knocked Up”, Charlyne Yi is ridiculously unfunny as the pill-popping Jodi, delivering a painfully awkward scene under drug influence. Did Segel or O’Dowd even need to be in the movie? I wanted to like this movie, but I just couldn’t get on board with it. A huge disappointment.